Kiosks offer an environmentally friendly alternative to print brochures & advertisements. The Grand Pacific Palisades Resort offers kiosks for visitor use. The resort kiosk includes options for activities, events, food, and more. The Hospitality Hotspot program is a virtual concierge touchscreen terminal deployed at the Grand Pacific Palisades Resort and the Carlsbad Seapointe Resort in lobbies and public areas. It provides resort visitors with an interactive tool to identify local attractions, retrieve coupons, and create awareness around resort amenities, and navigation around resort properties. Grand Pacific Palisades Resort & Hotel and the Carlsbad Seapointe have partnered with Dynamic Business Design to provide their guests with the latest technology via an application called the Hospitality Hotspot. The Hospitality Hotspot connects guests to local shopping, restaurants, activities, and other services. Guests using the virtual concierge touchscreen and Hospitality Hotspot application can find valuable information, phone numbers, coupons, and links to restaurants, attractions, shopping, and resort amenities. The Grand Pacific Palisades and Carlsbad Seapointe Resorts have added the ability for local businesses to advertise via the hotspot, providing visitors both paid and unpaid content via the resort-provided devices. This advertising provides a beneficial service to visitors via coupons, offers, and information, as well as a monetary benefit to the resorts as it helps to offset the costs associated with implementing the virtual concierge and, eventually, serves as a profit source to the resorts themselves. Currently, two devices are deployed at the resorts, both running KioWare Lite for Windows. The content on the devices can be modified by assigned resort staff or, alternatively, resorts can purchase a maintenance plan for content to be managed by Dynamic Business Design. Moving forward, the Hospitality Hotspot can also be run on touchscreen devices utilizing Android Operating Systems, secured with KioWare Lite for Android to provide security and reliability. Hardware includes ELO Touchscreens, HP Touchsmart Computers, and Samsung Tablets. A plethora of screen sizes and device types are available. The Hospitality Hotspot is also available for download as a mobile application, allowing visitors to access the application while in their rooms or away from the facility. The Hospitality Hotspot also integrates with a printer, allowing visitors to print relevant information such as directions, coupons, confirmations, menus, boarding passes, and more. From a technical standpoint, the Hospitality Hotspot built in HTML5 enables staff to utilize Google Analytics to track visitor behavior. 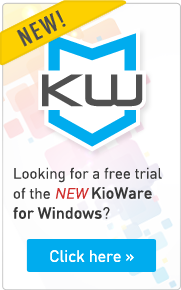 KioWare is award winning kiosk system software designed for the Windows OS in 2001, and for Android tablets in 2012. KioWare deploys browser-based applications into a kiosk mode environment easily and inexpensively, securing the operating system, and allowing users to access only the application. Each client has the ability to customize KioWare to his or her needs, with a product line ranging from basic browser-lockdown to server based remote monitoring. Dynamic Business Design is the company behind the Hospitality Hotspot application. Based in Vista California, they offer web design and marketing solutions as well as virtual directories such as the Hospitality Hotspot, and other retail and restaurant applications. Want more guidance on your hospitality kiosk project? Hospitality Kiosks: Helpful Hardware Peripherals covers how hardware peripherals play an important role.